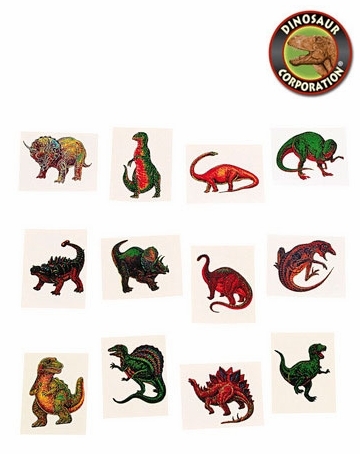 Cool dinosaur temporary tattoos are always a big hit for children loving prehistoric. Dinosaur tattoos are easy to apply and remove. Safe and non-toxic. * 12 assorted dinosaur tattoos: T-rex, Triceratops, Apatosaurus, Ankylosaurus, Styracosaurus, Allosaurus, Stegosaurus, Spinosaurus, Plateosaurus, Skutellosaurus. * Kids love them! Great idea for prehistoric dinosaur birthday party.